The Punto is another global key product for Fiat-Chrysler. Unfortunately, this important nameplate, that will soon turn 20 years, is facing its most difficult times and there isn’t a clear future. 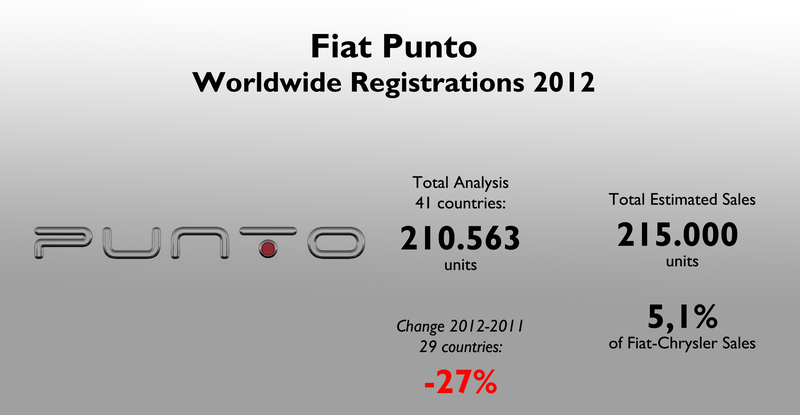 In 2012 there were around 215.000 Puntos sold worldwide, and a year earlier Fiat sold around 290.000 units. In fact, the Punto faced the worst fall among big nameplates of the group. Marchionne’s decision to delay the arrival of the fourth generation has forced many clients to move to other brands that offer fresh products. Current Punto (aka Grande Punto) was launched in 2005 and brought big numbers to Fiat during its first 3 years of life. But now this car (after many tiny facelifts) is 8 years old, and almost all of its competitors are younger (except for the current Opel Corsa, which uses the same platform of the Fiat). The first Punto was on sale from 1993 till 1999 (6 years). The second one was available from 1999 until 2005, but the current one seems to that will be available till 2015/2016 (10 years!). Sales in 5 out 29 markets analyzed had a positive growth. The Punto had the worst fall in the top-10 best-selling models of Fiat-Chrysler. However it is still an important product for the group’s total sales. Source: see at the bottom of this post. The top-10 markets for the Punto remained the same year-on-year. The only big change came from the Netherlands, where sales dropped a massive 56%, making the UK numbers to gain 3 positions in the ranking. No information for sales in Belgium during 2011 (this is an important market for the Punto). Source: see at the bottom of this post. Italy continues to be the land of the Punto, counting for 39% of total sales. Of course, the big fall in these market (down almost 40.000 units) is the main cause of the disaster. Nevertheless, this car continues to be the best-selling B-Segment car in Italy. Brazil comes at second place, with exactly half the number sold in Italy, but with a healthy 16% positive growth, thanks to the restyling. 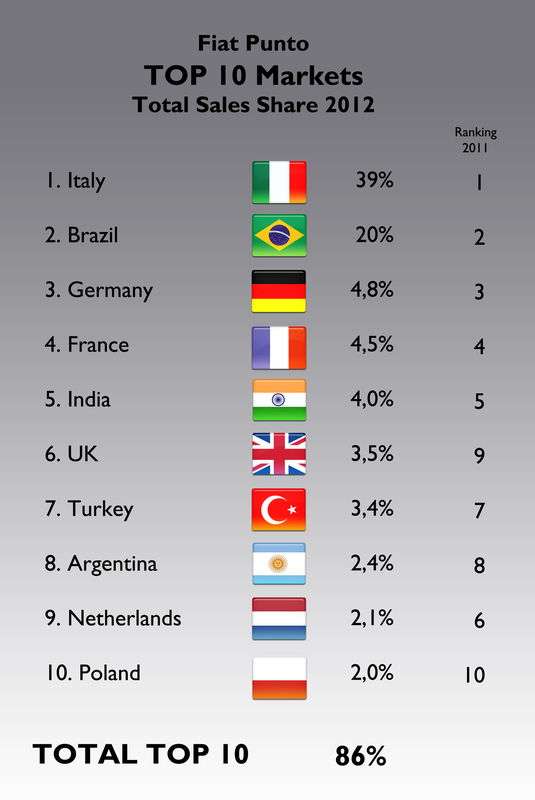 The top-5 market remain the same: Italy, Brazil, Germany, France and India. Big loses in the Netherlands, Argentina and Poland, and of course in Spain, Portugal and Greece. 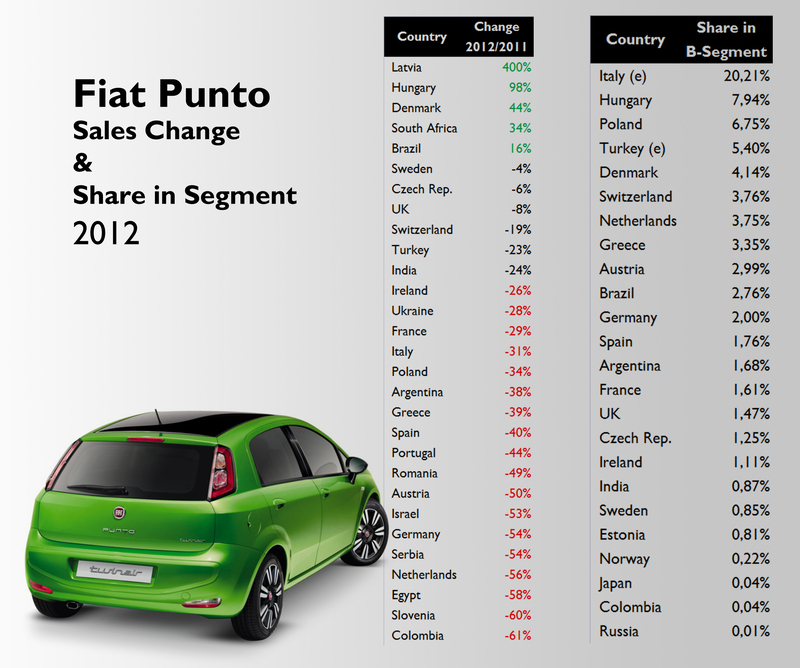 The Punto own 20% of Italian B-Segment, and is followed by the good segment share in Hungary, where it controls 8%. Poland is also an important market for this car. There is no data coming from Serbia, where the Punto was the best-selling car, as it was built locally. Anyway, last year’s results show that at its 20th birthday, the Punto is slowly dying and there isn’t a clear future for this important nameplate. The Punto is another global nameplate of Fiat, with presence in many markets (though it is not available in USA, Canada and China). Source: see at the bottom of this post. Negative growth in almost all of the markets. 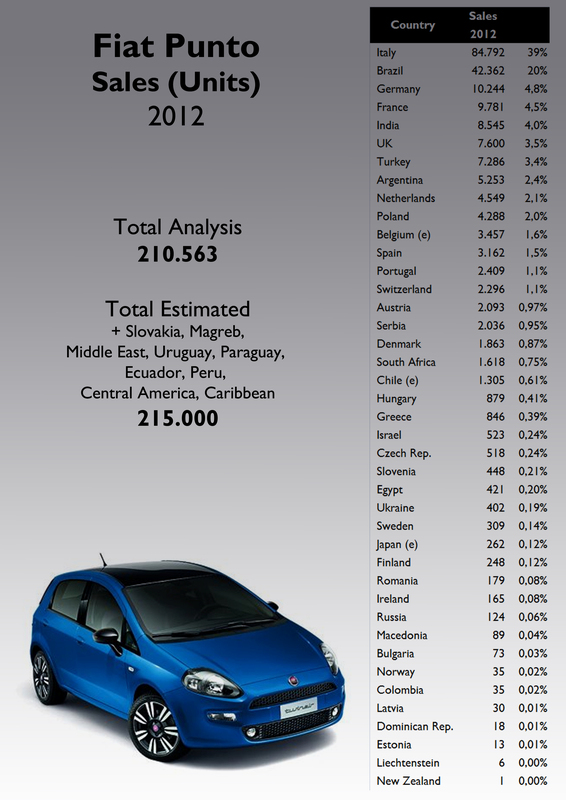 Notice that the Punto has a bigger market share in European mid-size markets than in larger ones. Source: see at the bottom of this post. Almost 1 out of 3 B-Segment cars sold by Fiat-Chrysler in the whole world corresponded to a Punto. Source: see at the bottom of the post. Source: Fiat Group’s World data basis, Best-Selling cars blog, Autoblog Argentina, Automotive Austria, Fenabrave, Fiat Chile, Revista Motor, SDA, Bilimp, Fiat Dominican Republic, MNT, Trafi Finland, KFZ Germany, SEAA Greece, Data House Hungary, Carsitaly.net, Beepbeep Ireland, Focus2move.com, UNRAE, Jaia Japan, LPAA Latvia, MIA New Zealand, Carmarket Poland, Motores Magazine Portugal, ADS Slovenia, Carmag South Africa, ANIACAM Spain, Bilsweden. Marchionne seems to be stretching the product cycle on most FiatChrysler products, and no nameplate feels it more than Punto. I understand holding development costs down for european based product until the EU market turns, but Punto is a global product and deserves much more attention. A properly redesigned Punto could even be a contender in the US market under either the Dodge of Fiat brand. Marchionne has the bean counters more focused on the merger with Chrysler than developing competitive product for FIAT, ALFA or LANCIA. I fear this may prove to be a fatal mistake. Primary focus should be on developing world class products, – if the company has sufficient revenue from sales of competitive vehicles, merger funds can always be found. How many Chrysler or Fiat’s nameplate were able to sell > 200.000 cars/trucks? Only a handful. So it’s very stupid to leave B segment to the competitors, when with a new car you could create a lot of problems to other european manufacturers. My figures show that only 5 nameplates were able to sell more than 200.000 units in 2012: Ram Pickup, Fiat Uno, Fiat 500, Fiat Punto, and Jeep Grand Cherokee. I am not sure if the the Fiat Palio and Dodge Grand Caravan surpassed that barrier (my numbers: 197.000 for the Palio, and 193.000 for the Dodge). i like your blog very much and read it regulary. What do you think about the rumor that sergio Marchione has skipt Frakfurt because of a meeting with the VEBA about the remaining Chrysler shares? Do you think that we coul expect a BOOM of new Models and innovation as soon as the VEBA Problem is resolved? If xes, what do you think happens next or at first? Thanks for your comment. No idea about Marchionne’s recent absences. However, he is working hard to find a solution to VEBA problem. I would say that’s his priority now. A boom as soon as VEBA sells its part? I don’t think so. European market will take longer than expected to recover. Nevertheless, the situation will be different, as there will be more cash available for the troubled Alfa Romeo. First step would be to relaunch that brand, in my opinion. Punto is the soul of FIAT ( 500 is just a tribute to the past). FIAT is making a big mistake has been thet car left out. This car was responsible for taking the company from the brink of bankruptcy in other times and have fans around the world. Is a strong (untapped) brand.